Description: A Vought F-8A Crusader was selected by NASA as the testbed aircraft (designated TF-8A) to install an experimental Supercritical Wing in place of the conventional wing. The unique design of the Supercritical Wing (SCW) reduces the effect of shock waves on the upper surface near Mach 1, which in turn reduces drag. In this photograph a Vought F-8A Crusader is shown being used as a flying testbed for an experimental Supercritical Wing airfoil. The smooth fairing of the fiberglass glove with the wing is illustrated in this view. This is the configuration of the F-8 SCW aircraft late in the program. The SCW team fitted the fuselage with bulges fore and aft of the wings. This was similar to the proposed shape of a near-sonic airliner. Both the SCW airfoil and the bulged-fuselage design were optimal for cruise at Mach 0.98. Dr. Whitcomb (designer of the SCW) had previously spent about four years working on supersonic transport designs. He concluded that these were impractical due to their high operating costs. The high drag at speeds above Mach 1 resulted in greatly increased costs. Following the fuel-price rises caused by the October 1973 oil embargo, airlines lost interest in near-sonic transports. Rather, they wanted a design that would have lower fuel consumption. Dr. Whitcomb developed a modified supercritical-wing shape that provided higher lift-to-drag ratios at the same speeds. He did this by using thicker airfoil sections and a reduced wing sweepback. This resulted in an increased aspect ratio without an increase in wing weight. In the three decades since the F-8 SCW flew, the use of such airfoils has become common. Description: The F-8 Supercritical Wing was a flight research project designed to test a new wing concept designed by Dr. Richard Whitcomb, chief of the Transonic Aerodynamics Branch, Langley Research Center, Hampton, Virginia. Compared to a conventional wing, the supercritical wing (SCW) is flatter on the top and rounder on the bottom with a downward curve at the trailing edge. The Supercritical Wing was designed to delay the formation of and reduce the shock wave over the wing just below and above the speed of sound (transonic region of flight). Delaying the shock wave at these speeds results in less drag. 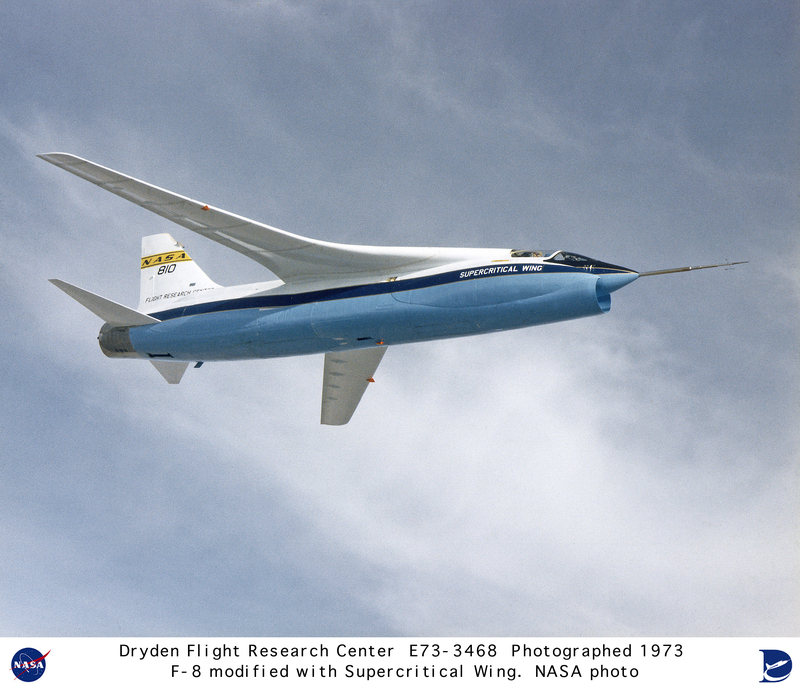 Results of the NASA flight research at the Flight Research Center, Edwards, California, (later renamed the Dryden Flight Research Center) demonstrated that aircraft using the supercritical wing concept would have increased cruising speed, improved fuel efficiency, and greater flight range than those using conventional wings. As a result, supercritical wings are now commonplace on virtually every modern subsonic commercial transport. Results of the NASA project showed the SCW had increased the transonic efficiency of the F-8 as much as 15 percent and proved that passenger transports with supercritical wings, versus conventional wings, could save $78 million (in 1974 dollars) per year for a fleet of 280 200-passenger airliners. The F-8 Supercritical Wing (SCW) project flew from 1970 to 1973. Dryden engineer John McTigue was the first SCW program manager and Tom McMurtry was the lead project pilot. The first SCW flight took place on March 9, 1971. The last flight of the Supercritical wing was on May 23, 1973, with Ron Gerdes at the controls. Original wingspan of the F-8 is 35 feet, 2 inches while the wingspan with the supercritical wing was 43 feet, 1 inch. F-8 aircraft were powered by Pratt & Whitney J57 turbojet engines. The TF-8A Crusader was made available to the NASA Flight Research Center by the U.S. Navy. F-8 jet aircraft were built, originally, by LTV Aerospace, Dallas, Texas. Rockwell International’s North American Aircraft Division received a $1.8 million contract to fabricate the supercritical wing, which was delivered to NASA in December 1969. 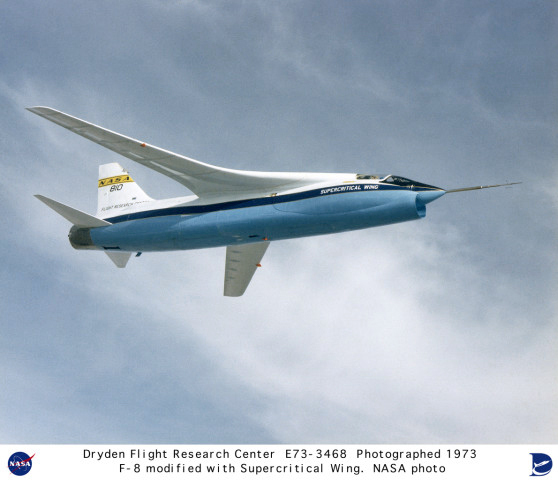 Keywords: Supercritical Wing; TF-8A; Crusader; fairing; F-8A; Dryden Flight Research Center; LTV Aerospace; Rockwell International; Pratt & Whitney; J57 engine; turbojet; transonic; Dr. Richard Whitcomb; John McTigue; Tom McMurtry; Ron Gerdes.